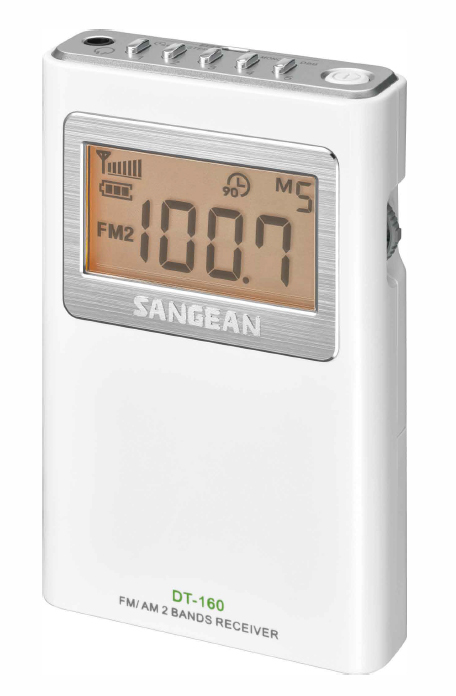 The Sangean DT-160 AM/FM stereo pocket radio is simple, elegant and very efficient. Enjoy over 100 hours of listening to your favorite programs (at normal listening levels) with two AA batteries (not Included). It plays unbelievable sound into the provided stereo ear buds (no speaker). This radio has 10 memories for FM and 5 for AM. The DBB Deep Bass Boost provides an amazing rich, deep sound for such a small radio. 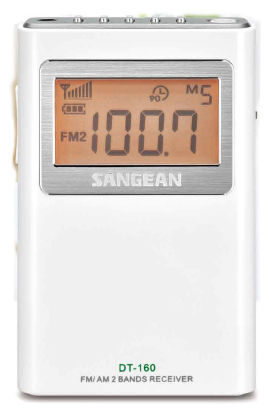 Other features include: 90 minute auto-shut off, battery low indicator, signal strength meter, lock, clock, stereo/mono switch and 9/10 kHz AM tuning steps. Only 2.5 x 4 x 0.8 inches and 2.5 oz. 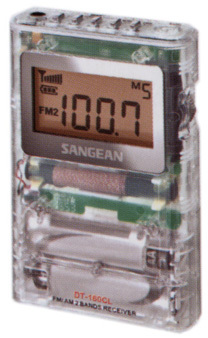 Available in white (shown) or clear case version. Clear version does not have clock functions. Copyright 2016-2018, Universal Radio, Inc.